Engineering student organizations gathered Monday to celebrate diversity in engineering with ethnic food, cultural displays, technical projects, engineering problems, and a panel of African-American, American Indian, Asian-American, and Latinx engineering students. The event was organized by the American Indian Science and Engineering Society (AISES), Mexican American Engineers and Scientists (MAES), National Society of Black Engineers (NSBE), and Society of Asian Scientists and Engineers (SASE), with support from the Associated Engineering Student Body (AESB). 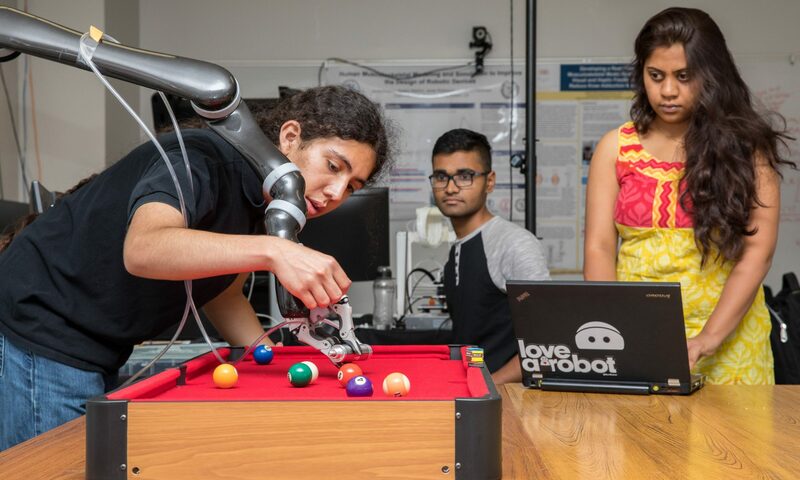 Mechanical & Aerospace Engineering Professor Ramin Esfandiari has been named CSULB’s 2019 Outstanding Professor of the Year. “I am filled with gratitude for such recognition, as I have simply followed my passion in the past 32 years,” he said. Mechanical engineering senior Jairo Maldonado-Contreras has been named the CSULB College of Engineering’s 2019 Outstanding Graduate. A member of the Society of Hispanic Professional Engineers, he has held internships at the NASA Jet Propulsion Laboratory, Massachusetts Institute of Technology, and Northwestern University. After graduation from CSULB, he will pursue a PhD in robotics at GeorgiaTech, studying human-intent recognition algorithms used to control prostheses and exoskeletons under advisor Dr. Aaron Young.